Plastic manufacturers also cater orders of small plastic parts. However, creating small plastic parts is time consuming and quite difficult. Fortunately, nowadays the advancement of technology helps in creating these small parts easier. It is through the help of silicone molding materials and two-part polymers. There are cases in which there is a need to join several small plastic parts together. This can be possible because there are several ways of making small plastic parts. One of the processes used by large manufacturing companies in creating small plastic parts is through plastic injection molding. This is the easiest way in order to produce these small parts regularly and it gives the opportunity to create huge amount of small plastic parts in bulk. Usually, car manufacturing companies need thousands plastic parts in making cars. This can be obtained by using machine for plastic injection molding. 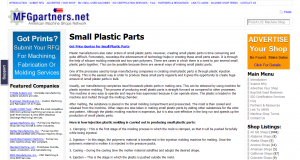 This process of producing small plastic parts is straight forward as compared to other processes. The machine is very easy to operate and require less supervision because it can operate alone. The plastic is loaded in the machine and melted through the melting chamber. After melting, the substance is placed in the small molding compartment and pressurized. The mold is then cooled and released from the machine. Other steps are also taken in making small plastic parts by adding other substances for the color and pattern. Although the plastic molding machine is expensive, but it is also cost-effective in the long run and speeds up the production of small plastic parts. 1. Clamping – This is the first stage of the molding process in which the mold is clamped, so that it will be pushed forcefully while being injected. 2. Injection – In this stage, the polymeric material is transferred in the injection molding machine for melting. Once the polymeric material is molten it is injected in the pressure packs. 3. Cooling – During the cooling time the molten material solidifies and adopts the desired shape. 4. Ejection – This is the stage in which the plastic is pushed outside the mold. This process of producing small plastic parts is advantageous because it lowers the labor cost while keeping the production level higher. Likewise, the manufacturer can have the opportunity to produce small plastic parts in large volume and little waste incurred. Thus, you can expect lower scrap costs. On the other hand, there are other processes of manufacturing small plastic parts specifically for low-cost and low volume buyers. Some of the options include plastic fabrication and machining, 3D printing, pour molding, dip molding, thermoforming and bridge tooling or silicon tooling. However, each technique of producing small parts has its own specific work. For an instance if the small parts have complex geometry with internal detail and undercuts then most likely the ideal method is to use 3D printing. On the other hand, if the small plastic parts need to be low friction and mechanically strong then it is necessary to use materials that are available in bar form. The best process to use is through plastic welding and simple machining. In addition, small plastic parts can also be made through plastic welding. It is because most thermoplastics can be welded through the plastic welding equipment. This process of making small parts is also useful in joining several pieces of plastic parts together. On the other hand, other technique such as fabrication and machining are also used in manufacturing small parts. This technique is done easier just like in metal parts. Similarly, 3D printing is the most popular methods of producing small plastic parts. Aside from rapid manufacturing, in 3D printing you need not use any tooling. It is because this option of making small parts is done through 3D CAD data. Moreover, plastic manufacturing companies are also using pour molding method in making small plastic parts. This method is carried out by pouring liquid resin into the mold. However, when using this method in making small parts it is important to ensure that the molded plastic parts should have drafts on the wall as well as avoid undercuts so that the component can be easily pulled from the mold. The substance that is used in making small parts through pour molding is urethane. Another low cost method of producing small plastic parts is through dip molding. Some small parts produced through dip molding include housings, casings, covers and plastic caps. However, it is important to pay attention on the dimensions of materials, the outer shapes as well as the accuracy of dip molding. Thermoforming is also used in making small plastic parts. However, this technique is also applicable even for large plastic panels. Thermoforming is done by heating plastic film and place it into a mold to adopt the shape and then cooled. The good thing about this technique of producing plastic parts is that it can be done even at home by using oven for heating. Aside from the different methods of manufacturing small plastic parts, plastic manufacturing company also pays close attention in measuring the small plastic parts. It is important in order to ensure uniformity of shape and size. A device is used in determining the accuracy of the measurements of the small plastic parts that is called MiniScan EZ spectrophotometer. This device can measure individual part or by batch. If you are looking for company that specializes in manufacturing small plastic parts, then you can contact MFGpartners.net. We accept RFQs for small parts as well as larger parts. You can expect that this company delivers high quality products and satisfactory service in timely manner. That is why you can ensure that your order will be done and delivered on time so that it will not interfere with your business and at the same time offers the service at reasonable cost. Furthermore, the company can help in determining the right techniques and method in making small plastic parts that suits your needs or projects.